This book is your hands-on guide to starting your own profitable affiliate marketing business quickly, easily, and inexpensively. Packed with time and money saving techniques including twelve ways to drive traffic to your website at no cost - this comprehensive guide is all you need to make big profits as an affiliate marketer! Packed with time- and money-saving techniques - including twelve ways to drive traffic to your website at no cost - this comprehensive guide is all you need to make big profits as an affiliate marketer! Reader Deborah Crawford of Memphis, TN says,"I don't know anyone making a fortune with affiliate marketing, but I do believe it is possible, which is why I bought this book. If you are an affiliate marketer, you might find much of this book repetitive. But, if you are not making a fortune and want to, then this book is for you. "I like this book because there are actual "how-to's" in here - how to set up tracking tools and spreadsheets, how and when to create content, how to promote your business, how to get your website up, when to expand your business, what to do when an affiliate doesn't pay, how to find affiliates, and much more. "If you are looking for get rich quick scams, look somewhere else. 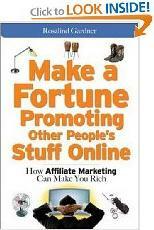 If you are looking for a guide to having your own successful affiliate business, get this book."